This would have been, more correctly, referred to as 'The Anatomy of a Round'. However, 'bullet' seems to flow better, so I hope you'll permit me this one bit of artistic license in the article's title. If what you're actually looking for is how to tell what a bullet is from its abbreviation (FMJ, etc), then you should check out the projectile abbreviations guide. A grain is 1/7000th of a pound. This is how both powder and bullets are weighed. Usually, when you see a box of ammunition, it will state the weight of the bullets in grains. However, the powder charge is usually not listed. While the metric system would be equally well suited to expressing the weights of charges and projectiles, the Imperial system is the one most commonly used in reloading components. Projectiles, for instance, are usually sold by caliber and not millimeter. As mentioned above, bullets are weighed by the grain. A bullet which weighs 55 grains (typical for 223 caliber) weighs .0078571428 pounds. The sheer number of decimal points should make it obvious why bullet weights are expressed in grains, and not in fractions of a pound. Furthermore, the firearms industry isn't likely to switch to the metric system for weights at any point. To add further confusion, bullets are frequently listed by caliber only, for rounds which are commonly expressed in millimeters. For example, the 7.62x39mm cartridge uses a .311 caliber bullet. It is expected that if you get set up to reload a caliber, you will learn the appropriate caliber designation for the bullets you're using. You will find documentation on the various bullet abbreviations here. One thing to be aware of in bullet design, is that a cannelure is the small grooved ring around a bullet, which indicates how deeply it should be seated in the case. Without a cannelure, you have to rely on neck tension to hold the bullet, and have no way to visually identify a bullet that's seated too far forward. There are many types, with a variety of burn rates and residue. Like bullets, powder is measured in grains, of which there are 7000 in a pound. Powder is typically sold by the pound. Of these various elements, the primer is the least variable. There are only four common sizes of primer - large rifle, small rifle, large pistol, and small pistol. Less common sizes are 50 BMG, and a plethora of Berdan sizes which very few folks ever reload with. Primers are generally inexpensive; a box of 5000 can be had for around 2 cents a primer. The main variation between primers of a certain size, is how 'hard' or 'soft' they are. Extremely soft primers are easy to detonate; hard primers require more force. It is possible to load soft primers into rifle rounds in order to result in fully automatic fire, but only a complete idiot would do this in any conventional firearm design. If you've been looking for a way to remove a hand or a few fingers, this can be an effective way to do it when your gun explodes due to an out-of-battery discharge. Boxer primers are a hollow brass (or other soft metal) "cup" with a small amount of impact-sensitive explosive material in the bottom. The "cup" also has a small piece called the "anvil", which has three legs which face upwards towards the bullet, and a center point which contacts the material in the bottom. 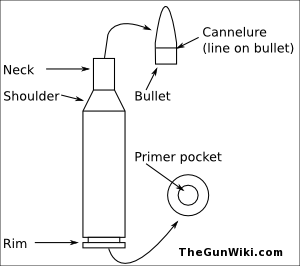 When the firing pin strikes the center of the primer, the impact-sensitive material is sandwiched between the center of the anvil and the bent-in base of the primer, causing a tiny explosion. The burning gasses are then sent up through the flash hole in the center, igniting the gunpowder in the case and ultimately propelling the bullet down the barrel. Berdan primers are commonly found in older European ammunition and most communist bloc ammunition. Its basic operation is identical to that of the Boxer primer, except that there is no "anvil" in a Berdan primer. Instead, there's a small protrusion in the center of the brass case which acts as the anvil and is the reason why Berdan cases are generally considered non-reloadable. The burning gasses are directed through a pair of flash holes, both placed off center in the brass, and the anvil in the center will merrily break the depriming punch on a reloading press. There are specialized tools and techniques to deprime Berdan cases, but they are generally not suited to rapid production. These are two different means of measuring the diameter of a bullet. A caliber is generally a fraction of an inch, while millimeters are, well millimeters. While these may seem to be precise numbers (7.62x39mm, for example), most of them actually aren't. 7.62x39mm rounds use .311 caliber bullets, whereas 7.62x51mm rounds use .308 caliber bullets. When buying ammunition, it's not uncommon to see "180gr hollow-point" ammunition right next to "230gr full metal jacket" ammunition, both in 45ACP. The "180gr", etc, is the weight of the actual projectile in grains. The projectile is the bullet only, not the rest of the case. To weigh one, you would have to remove it from the loaded round and put it onto a scale sensitive enough to provide its weight. Because this is not a readily performed procedure for the average guy who just bought his gun, you should simply trust that, for factory-new ammunition, the weight of a bullet is the same as what it says it is. There are a variety of reasons for these different weights, and it is not necessarily power. A heavier bullet will have more material, but assuming the same pressure propelling it, it will have a slower velocity and will start to drift downward faster than a lighter bullet. A lighter bullet will be be more affected by wind or objects than a heavier one, unless of course it happens to have an unconventional (armor piercing, for instance) core. One example of lighter vs heavier bullets, is that when 223 rounds pass through leaves, their accuracy is hugely impacted. When a 308 round, which is a much larger bullet with more kinetic energy behind it, passes through a leaf, it does suffer a little but nowhere near as much as the 223. Corrosive ammunition is not, in and of itself, corrosive. What causes corrosion are various salts which are deposited by the primer (and in some cases, the powder) in the places where carbon buildup normally occurs. These salts absorb moisture from the air, and the moisture causes rust. Yugoslavian rifles, due to most of them lacking chrome lined barrels, are particularly likely to develop rust issues from corrosive ammunition. However, the salts are not restricted to the barrel alone, and may also infest the gas system and FCG area. Salt can be dissolved and flushed out by washing out the rifle with ammonia, windex, or warm soapy water, and then drying it out immediately. If you want to learn more about what makes a loaded round tick, you will probably want to read the Introduction to Reloading article.